Thanks PAtsbox. I have no problem posting pics and the like with my "monitor". I can copy, save to camera roll, on my cell phone and send to anyone who has picture capabilities on their phone. As part of ongoing efforts to derive a scientifically testable multiverse theory, a team of researchers proposed recently that parallel universes exist and that they influence each other. The theory that parallel universes exist is termed the multiverse theory. The multiverse theory challenges the older single universe theory by claiming that many universes exist. The multiverse theory was first proposed by physicists in the twentieth century as a way of explaining several baffling aspects of quantum mechanics, a field of physics that seeks to describe the behavior and structure of matter and the physical universe at the small scale level of fundamental particles. One of the earliest versions of the multiverse theory was the “many-worlds interpretation” of quantum mechanics proposed by physicist Hugh Everett in 1957. According to Everett’s “many-worlds interpretation" of quantum mechanical phenomena such as the so-called universal wave function, many and perhaps infinite worlds exist as alternate histories and futures of our known universe, and each universe is real. However, Everett conceived of the parallel universes representing alternate histories of our given universe as existing independently without influencing or interacting with each other. Everett’s many-worlds interpretation effectively denies the concept of wave function collapse which suggests, under the single universe theory, that each time a quantum measurement is made only one of the myriads of alternative histories of our universe is actualized. According to Everett, our multiverse is constantly branching into multitudes of equally real universes in which all possible alternative histories are actualized. Thus, in an Everett many-worlds multiverse, there exists a universe in which you were not born and another in which you were born. There exists a universe in which you died a car crash last week and another in which you became president of the United States. In some universes, Hitler won the Second World War, and in others the Russians nuked Washington at the height of the Cold War. According to Everett’s interpretation, universes representing all possible alternate histories of our world exist as parallel non-interacting universes. The idea that parallel universes do not influence each other at all was the major point of criticism of Everett’s theory because from the scientific perspective the idea of parallel non-interacting universes is a non-testable hypothesis. And now this guy saying we can't change things? (At least "mentioning" that IDEA). Is the multiverse physics, philosophy, or something else entirely? The many universes interpretation could settle some lingering questions in physics. That is, if it’s correct at all. Artist's impression of unborn planets in the evolving universe. The idea of the multiverse — or the theoretical possibility of infinite parallel universes--straddles a strange world between science fiction and a plausible hypothesis. Though scientists have no direct evidence for the multiverse's existence, some theoretical models suggest the multiverse could solve some key riddles in physics, such as why the parameters of our universe, including the strength of the the electromagnetic force between particles and the value of the cosmological constant, have values that are exactly in the small range required for life to exist. Perhaps, some scientists posit in one version of the multiverse theory, there are billions of other universes out there with all different possible values of these parameters—ours just happens to be the one with the right values for life. But how credible is a scientific theory that might not be testable? Scientists are constantly pushing the boundaries of our knowledge, which includes developing ideas in areas where evidence is scarce. However, theories like the multiverse have drawn criticism from some scientists, who warn of the danger of speculation beyond what data can tell us. In a well-known 2014 paper in Nature on the topic, scientists George Ellis and Joe Silk warned against what they saw as a troubling new trend in theoretical physics: the acceptance by some in the field that a theory, if it is elegant and explanatory enough, does not need to be tested experimentally. They argued instead that to be scientific, a theory must be falsifiable—an idea based on centuries of tradition. “As we see it, theoretical physics risks becoming a no man’s-land between mathematics, physics and philosophy that does not truly meet the requirements of any,” Ellis and Silk concluded. Crucially, they stated that the credibility of science was at stake. If theoretical physicists started moving away from ideas about what constituted legitimate scientific theory, they might damage the public credibility of science, which could have catastrophic consequences at a time when debates about climate change and evolution are still ongoing. Some theories about the multiverse, they continued, lack the falsifiability required to render them legitimate scientific theories. For instance, multiverse explanations that rely on string theory—which itself is not yet verified—are not testable, and fundamentally speculative. “In our view, cosmologists should heed mathematician David Hilbert's warning: although infinity is needed to complete mathematics, it occurs nowhere in the physical Universe,” they concluded. Silk and Ellis seem to take issue not with the multiverse itself, but with scientific theories that cannot be verified via data. Ellis told Astronomy that there is no drawback to speculating on concepts like the multiverse to see where they lead. However, “the drawbacks come when one claims that such speculations are tested scientific theories,” he said. But what if the concept of the multiverse were testable? According to Ranga-Ram Chary, Project Scientist and Project Manager of the U.S. Planck Data Center at Caltech, it just might be. Chary published a study in 2015 in the Astrophysical Journal detailing strange abnormalities in the cosmic microwave background (CMB)—the radiation leftover after the Big Bang. 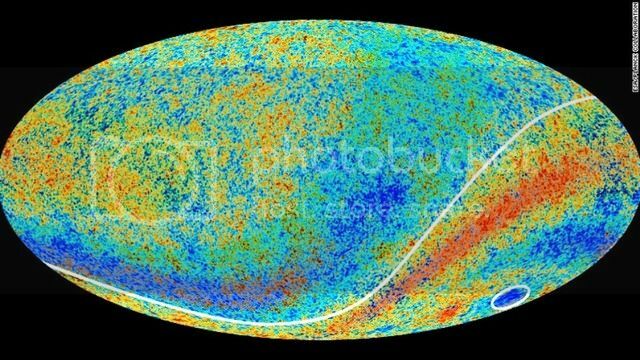 These abnormalities, found when analyzing data from the Planck telescope, could be evidence of “bruising” that occurs when one universe bumps up against another. Evidence of those imprints might be found in the data mentioned in Chary’s 2015 study. However, it’s possible that the abnormalities observed are merely an anomaly, or due to contamination from the interstellar medium (the matter between stars), so Chary stressed that further research is required. Still, Chary’s ideas about colliding universes would bring the multiverse into the realm of a testable hypothesis, and out of the realm of pure speculation. The bottom line? Most scientists seem to agree that rigorous science should involve falsifiable hypotheses—ones that can be confirmed or disproved by data. That standard is no different for concepts like the multiverse, and work like Chary’s presents one model of multiverse theory that is testable, and thus verifiable. Do you think that somewhere in a parallel universe there is your other self, who also reads this article? Dr.Greene, The author of the book The Hidden Reality: Parallel Universes and the laws of the cosmos, believes so. An increasing number of cosmologists agree with Green that there are plenty of other universes, and one of them is only a few millimeters away from us.however, we can not see it as it is located in a different dimension than the four that we know. With the development of research which is conducted at CERN, scientists are increasingly talking about the so-called. “New physics”, which promises a great understanding of the obscurity that hides the universe.This new direction includes work with dark energy, the mysterious force that could indicate the presence of “sister” of the universe around us. In this universe, they recently picked out special happening like. “Rushing” Andromeda galaxy at a distance of 2.2 million years the Milky Way speed of 320000 km / h. This phenomenon would make sense if the gravity of an unseen universe pushed these two galaxies together. And it could be proof that a parallel universe is somewhere close. Uncovering this cosmic mystery attracts a variety of countries including the EU, Taiwan, China, Russia and of course the USA. Therefore one might ever see a parallel universe? In a recent interview for the PBS American cosmologist Clifford Johnson said that at present this topic to talk like fiction, but that the scientists are trying to figure it out. Some experts think that’s what constitutes the human body – that of matter and the forces of gravity and magnetism – links us with the universe. Chinese local TV news have reports on thousands of residents in two areas reported separately seeing a huge city floating in the clouds. Onlookers, some who are said to have recorded the bizarre event were said to be mesmerised as a towering city of sky scrapers appeared from the clouds. The floating city in the sky was recorded over Yueyang, China. This Is The Smartest Kid In The World And He Thinks CERN Destroyed Our Universe! Everything was fine until the dude started talking about infinity with elephants and eggos. After that I was lost. My eyes are blinking..that kid is truly amazing and maybe because he is a kid..I understood him. All things are possible..and not. The universe IS a paradox unto itself..or the infinite number of universes are paradoxical. But then that's what theoretical physics is all about posing a possible theory and waiting and waiting for nature to prove it. There haven't been any great strides in proven theory for awhile..string theory, loop quantum gravity are all still on the theoretical drawing board. I'm a psychic..I go with my feelings..I think I've got a better 'proven' ratio than theoretical physicists..wow. They get paid a lot more tho. Still ...we have in common that we're all out there reaching. Kid said something truly amazing though. The interviewer said something about his 'mental capacity' or his gifted mind and he said 'no'...that everyone has something..we're all the same. For a kid his age..THAT was truly amazing..and shows he had some great parenting. And he doesn't leave God out of the mix as so many scientists do..I like that too. In MY universe there is room for ALL. He was struggling to give voice to what's pinging around in his brain..thing must be like Dr. Who's Tardis..bigger on the inside LOL. Actually we've been talking for months on the board here..that things seem 'off'. Maybe that's a part of why. We were shifted. If this kid's brain doesn't explode first...move over Hawking and Michio Kaku..
hmmmms...grabbing the ibuprofen bottle...since the earth is in an orbit around the sun...maybe we traverse through...various parallel universes. Maybe schizophrenic people are really victims of multi dimensions...their minds overloaded with conflicting input.. This is simple stuff if you just let your mind drive along unchecked and do NOT stop to think about it in any depth...do NOT try to explain it just 'feel' it. Wonder what the universe is like where Hillary won? The other half wouldn't be happy either. LOL The day I see everyone happy with a president is the day I figure Armageddon is in the wings. Kim Un would still be threatening everyone close at hand..Russia would be in a positive fury..and who knows what else..I figure with the way the world is...it would take a miracle not Hillary to get us out of the mess we're in. Since I didn't run for president, I don't have to have the answers..thank heavens. I'll be honest..I don't know how the rest of the world would see with any respect..a woman president of the strongest country in the world. I don't say a woman isn't capable..but it would be a formidable task. Hillary just did not have that 'spark' to me but then Donald has less so...who knows..maybe we'll wake up tomorrow and the world will be parked in yet another parallel and Swampy will be president woohoo.. I just don't know about N. Korea at all. He wasn't open to negotiation because like a child he doesn't want to give up his nukes..and he won't unless someone can make a homicidal/sociopath see reason. If he succeeds in developing an ICBM and a small enough pay load to fit it..anything could provoke him to use it and hit us. So..it IS a pickle I wouldn't want to be in. We see the pictures as having height, width and crucially, depth—when in fact it all originates from a flat 2-D screen. The difference, in our 3-D universe, is that we can touch objects and the 'projection' is 'real' from our perspective. (CNN)A recent astronomical observation of a "cold spot" in the universe is stirring the interest of scientists who are intrigued with an exciting and highly speculative theory that there may be more than one universe. In 1964, two scientists used a microwave receiver to hear the radio hiss that is the modern remnant of the Big Bang. While the universe after the Big Bang was unimaginably hot, it has cooled over the eons and these measurements showed that the temperature of the universe is about 3 Kelvin (-455 ºF). Further, the temperature is extraordinarily uniform. However, in 1998, the COBE satellite discovered that the temperature of the universe wasn't perfectly homogeneous. There were places in the sky that were a little hotter and colder than average. These variations are very small, only about one part in 100,000. There have been improved measurements of this non-uniformity, with the most recent satellite (called Planck) publishing its measurements in the early part of this decade. These new measurements are much more precise and they support the earlier conclusions of the COBE satellite. Scientists believe these small variations are actually remnants of subatomic-sized temperature differences that were present at the moment of the Big Bang that are now stretched across the entire universe. And, while that is inarguably an extremely cool idea, it's not the thing that has scientists' attention at the moment. There's another topic that is literally cooler still. Our current theories can pretty much explain the pattern of cold and hot spots across the sky, except there appears to be an anomaly. There is a spot in the heavens that is unusually cold. Scientists have unimaginatively called it "The Cold Spot." The circled area (lower right-hand side) in this map of the cosmic microwave background left by the Big Bang is the "Cold Spot" that scientists are investigating. At only 150 microkelvins below average, this seems like a very small variation. But it is a much bigger temperature difference and it covers a much larger part of the sky than can be easily explained. There is something unusual going on. In about 2008, several scientists proposed that this cold spot in the remnant of the Big Bang fireball could perhaps be due to collisions between multiverses. The Cold Spot could be nothing more than a bruise on a particularly large peach. This is obviously an exciting idea. The possibility of confirming multiverses would vastly overturn mankind's vision of our place in reality. Copernicus taught us that the Earth wasn't the center of the universe, while Hubble taught us that not only is the Sun not at the center of universe, the Sun is a simply an ordinary component of a larger galaxy that is but one of billions. Discovering that multiverses existed would tell us that not even our universe is special. The idea of human exceptionalism would take another blow. Naturally scientists look critically at these grand ideas. Maybe there is a far more ordinary explanation for the Cold Spot. One such explanation of the Cold Spot is simply there that there is a void in the cosmos, which is to say a region of the universe with far fewer galaxies than usual. If true, as the primordial light from the Big Bang passes through this region, it loses energy and cools. This effect only occurs if the universe is expanding, but we know that it is, so the proposal is completely reasonable. A recent study announced on April 12 looked at this region of space to see if it really did have fewer galaxies than expected. The study suggests that there was a small deficit, but not nearly enough to explain the Cold Spot. In short, the obvious answer doesn't appear to be the right one. So what does it all mean? Although I'd bet that the void idea is the right one, this is a bet I'd be happy to lose, because I would be lying if I didn't say that I would love to see someone prove that the Cold Spot was caused by colliding universes. However, it is a highly improbable outcome. It is far more likely that additional studies will support a more ordinary cause. But the prospect of observing multiverses is an exciting one, so scientists are guaranteed to keep looking at it. Figuring out what is going on will take a lot more research, and nobody can definitively tell you what the final outcome will be. In the words of the eternally wise Yogi Berra, "It's hard to make predictions, especially about the future." We haven't even explored all of our planet let alone all of our universe..why do we need more? Child in a 3D world unaware of other dimensions. NASA. There has been more and more weight given to the idea that there are other realities and dimensions besides our own, which bump against us and even overlap us. With this idea comes hand in hand the notion that traveling between them could also be possible, and there are accounts that point to the possibility that not only is this possible, but that such portals between these realms have already been opened. Intriguing, often a bit scary, and always weird, these cases of alleged gateways capture the imagination, and make us wonder whether alternate realities not only exist, but have been visited by us. Perhaps the most well-known tale of a supposed inter-dimensional portal concerns the town of Ong’s Hat, merely a speck on the map and one of the numerous abandoned old villages scattered throughout located the remote Pine Barrens of the U.S. state of New Jersey. Purportedly getting its name from a man named Ong, who once threw up his fancy silk hat in frustration when the jealous lover of a woman he was having an affair with stomped on it, after which it became stuck on a pine branch, the town supposedly started as a single hut. By the 1860s, the village had apparently grown into quite a lively town known for bootlegging and supplying booze to the outlying areas. However, the town declined dramatically in the following years, and by the 1930s was all but abandoned, although it still showed up on maps, and in modern days it is merely feral, weed-choked ruins, crumbling buildings, and empty lots. The small, rural town would perhaps have forever remained an obscure backwater ghost town if not for a curious book called Ong’s Hat: The Beginning, which was written by Joseph Matheny and published in 2002. The book claims that in 1978 a man by the name of Wali Fard settled in the New Jersey Pine Barrens after purchasing 200 acres there. Fard, who was a member of the secretive cult the Moorish Orthodox Church of America, had allegedly just returned from traveling the world studying various philosophies, magical practices and spiritualist techniques in such exotic locales as India, Perisa, and Afghanistan, and he would then join another cult called the Moorish Science Ashram. He was apparently an eccentric man to say the least, moving onto the property with a ragtag group composed of some runaway boys and two lesbian anarchists. Once relocating to New Jersey, the book claims that Fard went about spreading the teachings of his sect and managing to draw about him quite a number of followers. Among this motley group of misfits, cultists, and general oddballs were two scientists by the names of Frank and Althea Dobbs, who were brother and sister and had their own bizarre history as they had been apparently raised within a UFO worshipping commune run by their father in Texas. The two had been doing research at Princeton on something they referred to as “cognitive chaos,” which is quite complex but basically entailed utilizing untapped parts of the brain to unlock vast human potential in the form of a wide variety of powers such as ESP, telepathy, curing diseases, conscious control of autonomic functions, and even halting the aging process, but they had earned the ire of their peers for their far-out fringe theories and been kicked out for what the university called “seditious nonsense.” It seems that the two siblings had never really been accepted in the mainstream or in academia, but with Fard they found themselves among outcast kindred spirits willing to listen to them. As soon as they migrated to the remote Pine Barrens, Frank and Althea supposedly immediately went about creating a makeshift lab in an abandoned barn, from which they could continue their work unfettered by the harsh criticism they had been subjected to before. So intrigued with their work was Fard and his cult that they subsequently established the “Institute of Chaos Studies” based on it, and this enabled the two scientists to have the funding and equipment that they needed to make progress the likes of which they had never seen before, as well as attracting two more local fringe scientists named Harold Acton and Martine Kallikak to help them. Among their many bizarre experiments were using various psychedelic drugs in an attempt to unlock mind powers, monitoring brain activity, and using electrical stimulation to try and manipulate the brain waves to produce the abilities they were convinced were lurking untapped within the mind. These experiments made use of an array of odd machines and devices, all slapped together and unorthodox to say the least. Among these was a device they called “The Egg,” which was supposedly more or less a modified sensory deprivation chamber hooked up to computers and with various electrodes attached to a human subject to measure physiological responses, as well as a helmet equipped with “brain wave manipulators.” Apparently there were several versions of the machine built, which showed some promise in allegedly providing better control of autonomous body functions and bestowing various other powers such as inner heat, enhanced healing, and remission of sickness. However, it wasn’t until the 4th iteration of the device that things allegedly got truly bizarre. This story I've heard before, hard to figure what to think but in light of the 'Mandalla effect' interest, it's not such a far fetch. Things..just a little bit off, but some very much the same. Hard to fathom that maybe there are countless versions of today, each one just a bit different. Makes me think that maybe there is some huge directory somewhere that keeps track of such. As the earth rotates, it passes through the 'astrological signs' and as it does, many people swear there are personality differences in people as we do. We ARE star stuff..made with the same building blocks, it's said so maybe we are effected by the movements of the stars and planets...and even dimensions we're not aware of yet. Maybe we're getting closer. Before you start screaming “Fata Morgana!” and have your neighbors wondering if you’re in some strange cult (again! ), most experts agree with you that the latest eerie and misty floating city to appear above a grounded one in China is one of those rare and unusual superior mirages. The real mystery that has them baffled is why they’re occurring with such frequency, not just in China but around the world. On June 6th, residents of Wuzhong City in north central China walked outside after a severe storm that dumped hail and four inches of rain on them to see not a rainbow (although conditions were right for that kind of formerly mystical and misunderstood phenomenon too) but a shadowy image of a city appearing to float high above their own skyline. As with many of these appearances, the floating city doesn’t seem to match the city it’s hovering over … hence the meteorologically uninformed may assume it’s a ghost city, a portal to a parallel universe or some government experiment. Those in the know know it’s the result of warm air sitting on top of cooler air (from the storm or a cold ground surface) causing light to be refracted in a way that tricks the mind into picturing objects (cities, boats, mountains) where it thinks they should be, not where they actually are. Once a phenomenon seen almost exclusively by sailors, the Fata Morgana has become more common recently and more often seen above land, as the many occurrences in China attest. What has caused this sudden increase? One thought is that the ubiquitous cellphone puts a camera in the hands of many who would otherwise have just said, “You’ll never believe what I saw at the beach!” The dense and ever-present pollution in China keeps eyes blurred and the air hazy, causing visions that might otherwise be easily identified to look strange and mysterious. Portals into parallel universes and government conspiracies to control the weather or scare the public with holograms! There will always be skeptics and disbelievers. Keep taking pictures of strange things in the sky and keep open minds. Humanity depends on it. A man experienced something out of the ordinary, which to date still can’t be explained. Usually around 6:30 AM, he wakes up but this day already was a bit different for him, as sunlight peered through his bedroom window. This he thought was odd, as usually it is still dark outside during this time. It was a Monday morning. Everything was going good for him, he had a good job in an office environment. He even had friends that worked at the same location. It was a typical 9 to 5 temporary position, using the computer, writing and filling out forms and answering phone calls. His cubical was the first one seen, after stepping off the elevator being located in the center of the office room. This day for him, turned out to be one of the creepiest moments in his life. The day was indeed different, he wondered what exactly happened to him that day. He reflected back to that unusual moment. At this time in his life, he was only 24 years old when this experience happened to him. He had been working at this location for 4 months, eyeing other opportunities to further advance his career. At first, everything was fairly typical this day—until he first wandered past the receptionist. She gave him a peculiar look almost as if she was frightened by his presence. He was laser focused this day, as the boss had been giving him a hard time—about some late assignments that were past due. On his way further down the hallway, he begins to get stares from other workers in different conference rooms. He also notices some people starring at him out in the open, where other cubical workers typically are. He begins to panic, thinking that he is going to be fired or something. With the expressions on everyone’s faces they seem to be more scared than curious. He thought to himself, wondering if he was going to find something he shouldn’t find out. He tried to ignore all of this as he approached his office cubical. To his surprise, something extraordinary was right before him. It goes from weird to terrifying. His heart begins to sink into his chest, as he simply couldn’t believe what he was seeing. Someone is sitting on his chair typing at his keyboard. For a moment, he thought the IT tech who was working on his computer to fix something. But this wasn’t the case at all. When the man turns he looks right into his eyes. It was at this moment, when the blood began to freeze in his veins. The man sitting at the desk is him. This man looked exactly like him the same face, hair and clothes on. His doppelgänger begins to pack up his papers and other belongings. They quickly take off running in the opposite direction of where he was exiting out of the building. He decides to chase after his double, trying to catch up to him. After looking around, he was nowhere to be found. Now, everyone is looking at him like he is crazy. He asked other co-workers who was sitting at his desk. Nobody knew anything. They said his desk had been empty all morning. Eventually, the boss was called over, as the man was freaked out sweating and bewildered at what had happened. The boss had been looking around all morning for him, checking to see if he was going to show for work or not. (every 15 minutes or so) He explained to the boss, what happened and the boss gave him some funny looks before walking away. What bothered the man is how his doppelgänger ran off. It was almost as if, he was up to something he shouldn’t have been doing. He reflected about what had happened in the bathroom, splashing water over his face. After starring at himself in the mirror, he became intrigued by his thoughts, eventually returning to his computer. On his computer desktop, a new document had been opened. Absent. Will be fulfilling role until recalled. with key information regarding the status of (me). Convinced this was an elaborate prank, he man became confused as he reflected back about this strange day. He eventually left the job, after suffering from anxiety attacks. He later found another job in Massachusetts. Now, he is much happier and less stressful after meeting face to face with his doppelgänger. Every time he looks into a mirror, it still puts him on edge. Good material for a novel maybe. But I think schwarzenegger did that in '6th Day' when he found out he was a clone. Maybe they got the idea from this guy.